The Extang Full Tilt Hinged Tonneau Cover / Truck Bed Cover offers the best of both worlds: Hinged at the cab of the truck and equipped with high quality gas shocks on each side, the Full Tilt Tonneau Cover opens and offers access to the entire truck bed with virtually zero effort. Want to haul some larger cargo? The Black Vinyl Cover quickly unsnaps from the frame and can be rolled up partially or completely. Want to take the cover off completely? The gas shocks have a quick release feature, allowing removal of the entire cover from the truck in less than one minute. Re attaching the cover is just as quick. You won�t be short on options or caught in a bind with the Extang Full Tilt Hinged Tonneau Cover. The Extang Full Tilt Hinged Tonneau Cover Installs in minutes with no automotive knowledge, drilling, or tools required! Follow the easy to read installation instructions and you�ll be on your way, bed covered, in minutes. 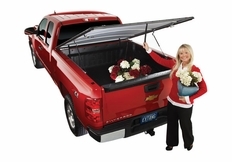 This USA made truck bed cover features a lifetime warranty on the frame and its spring loaded bows keep the cover tight and prevent it from flapping in the wind like many cheap knock-offs. The black vinyl tarp is commercial grade and features an industry leading 10 year warranty. If that wasn�t enough, the Extang Full Tilt Tonneau Cover improves fuel economy by as much as 10% due to the improved aerodynamics / reduced resistance of a covered truck bed. The Extang Full Tilt Tonneau comes in two styles of edging: Standard Snaps, or �Peel and Seal�, which is available for an additional fee (see drop down above). Take a moment to view the video demo (above) to see both styles up close and in action. 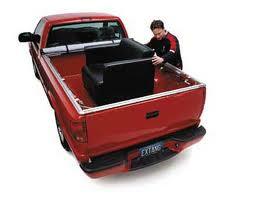 The part number for this Tonneau Cover is: 8515 and it fits 1973-1996 Ford Full Size Truck (8' BED) models. Note: The Extang Full Tilt Tonneau Cover Does NOT work with flipping bed extenders or "over the rail" bed liners! If your truck has bed rails, this cover will not fit without removing them in most cases. Under the rail bed liners are okay. We guarantee the lowest out the door price on our Extang Full Tilt Tonneau Covers. If you find a better out the door price (including shipping) for this item, please call our email us and we'll do our best to match or beat the price. 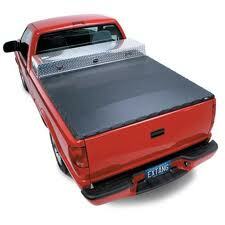 The Extang Full Tilt Tonneau Cover Does NOT work with flipping bed extenders or "over the rail" bed liners! If your truck has bed rails, this cover will not fit without removing them in most cases. Under the rail bed liners are okay. Requires no drilling or tools to install. Snap design allows cover to be rolled up in seconds if needed. USA Made with a lifetime warranty on the frame and 10 year warranty on the commercial grade black vinyl tarp.